Kenny Boettger getting a fit dialed in at Placid Planet Bicycles in Lake Placid. What bike did you ride this past winter, a fat bike perhaps? What bike will you be riding this spring, summer and fall, a road, gravel, cyclocross, triathlon… or, a mountain bike with 29-inch or 650b wheels, or are you still riding 26-inch wheels? Perhaps you are going to do some serious bike touring. Do you want to ride with someone on a tandem bicycle? Have you considered a recumbent model? New bike owner ready to give it a go at Tomhannock Bicycles in Pittstown. So you just picked one out and now what size will you get? Nothing worse than spending some serious dollars only to find out that the bike of your dreams does not really fit you. Famous last words, ‘It was on sale and too good to pass up.’ How about we provide some assistance to guide the selection of your next bike and advice about having it fit you. I have been on many rides answering questions about the bike I am riding or what bike would be my next one. My best advice has always been, buy the one that fits you. The conversation among cyclists eventually gets to the question of how many bikes should you have and the answer is N+1. One more than you currently have. Well that does not have to be the case any longer. There are new bikes on the market that can fulfill many of your requirements. The new models have disc brakes, either mechanical or hydraulic. They have wider forks and chain stays that will allow wider tires with slicks or other varieties with minimal or maximum tread similar to mountain bike tires. They can have flat or drop handlebars. They come in a choice of frame materials, such as steel, aluminum or carbon fiber. Some models have mounting points on the fork and frame for racks to support packs or panniers. The wheels come in different widths to accommodate various tires. The hubs for the wheels now come with thru axles instead of quick releases which offer greater strength but are not as easy to remove from the bike as a quick release. Gearing now can be a single speed, a single chain ring up front or a double or a triple chain ring. With so many possible choices it may be difficult to make a decision. So now it may understandable why some cyclists have more than one bike. Wait did I forget something? Of course, there is even more to consider. How about adding an electric motor assist to that bike. Electric bikes are allowed in some states but not all. There are many choices today so whether it is your first bike or your third, the type of riding you are doing certainly delineates the choices. Yet there is another consideration in choosing a new bike. How do you determine if the bike fits you? We are talking about more than what size bike shorts or helmet you wear. Just standing over the bike to see if your legs touch the ground or that the seat feels comfortable is insufficient. Matching the bike size and its comfort parameters to your body will greatly benefit your cycling experience. A bike should feel comfortable and allow you to be efficient on it. Everyone’s body is different. Some of us have long legs and short torsos; some people have broad shoulders and require a wider handlebar; some people may pedal a little bit differently than others; maybe you have one leg that is slightly longer than the other and you never even knew it! In addition to our bodies being the way they are, injuries or personal goals can affect how your bike should be set up to maximize comfort, efficiency and power. Fortunately, bicycles are machines with many adjustable parts. In fact, every point on the bike that your body touches can be changed out, altered or moved to fit you better. The idea is to make adjustments to the bike’s components with these goals in mind. Enhancing rider comfort is the priority. Whether it’s a ride around the block or a 100-mile ride you need to feel comfortable. You do not want to have your hands go numb, get saddle sores, or have knee pain while riding. 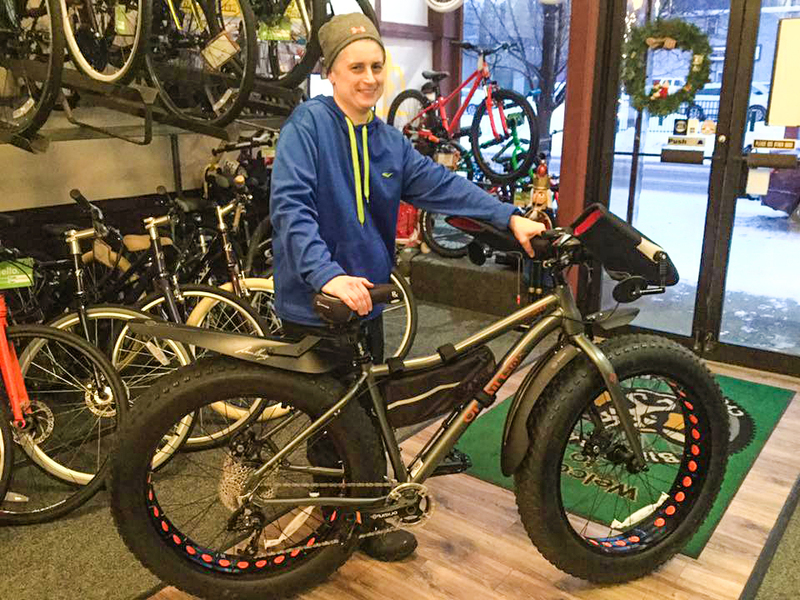 Another happy customer – new fat bike day! – at the Bike Barn in Cohoes. 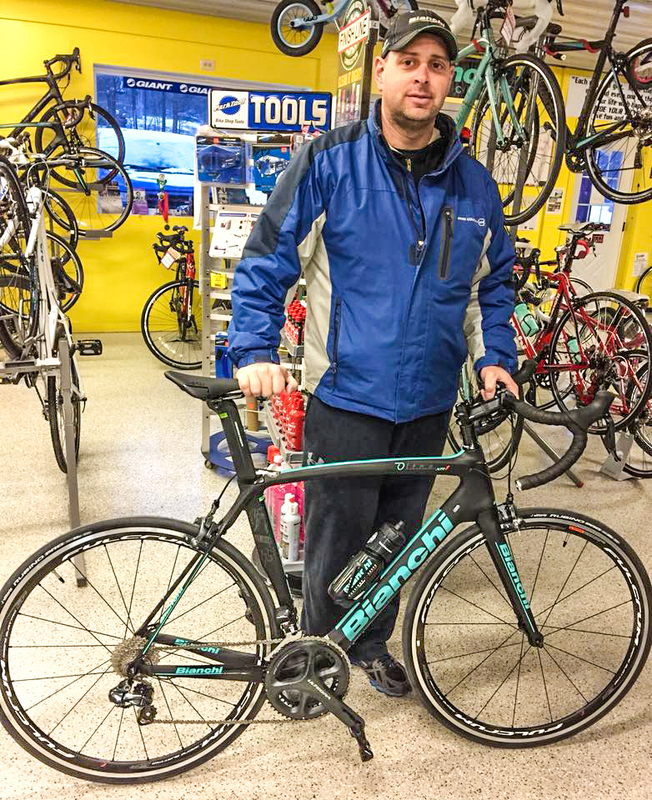 A good local bike shop that does a bike fitting will ask you what kind of riding you plan to do and if you have any previous injuries or physical issues that they need to accommodate. You may need a different handlebar or stem to adjust your reach to the handlebar to easily reach the shifters or brake handles. The stock seat on the bike may look comfortable but after sitting on it for an hour or two it may become unbearable. There are many choices of seats to accommodate the physical difference between men and women. It may be that a narrower seat will fit you better, believe it or not. Finding the correct seat height is critical to improving your performance on the bike as well as your sit comfort and preventing knee pain. Bikes have three points of contact: your hands, your seat and your feet. When you change one of the contact points it will affect the other two. Think of it as a triangle. Even the length of the crank arms is a variable. As bike frame sizes increase the crank arm length will generally increase as well. That does not mean it is right for you. For years I used a crank arm length of 175mm. After having some knee pain and getting a bike fit I changed to a 172.5mm length. Who would have thought that 2.5mm (one-inch) would have made a difference? A longer length is not going to give you more power. Think about how many thousand times you will be turning those pedals; having the right length will be more efficient and effective. There are a number of bike shops in the region that sell bikes and also provide fitting services. Consider the investment you are about to make on your next bike and how adding a fit to the purchase will provide a positive return on your investment. Many bike manufacturers provide specific models for women, but this doesn’t mean that they will easily fit every woman. Some manufacturers are discontinuing frames with female-specific dimensions and instead creating frames with performance geometry specific to the category the rider self-identifies with, like endurance, hill, gravel, etc. This accommodates gender-specific components, like saddle, handlebar and crank length. Women may get the same frame as men, but all of the touch points would be dialed in for a women rider of that size. When purchasing a bike for children insure that they can put their feet on the ground when stopping. Do not purchase a child’s bike thinking they will grow into it. Some of the regional bike shops that perform a fitting and advertise with us, include: Bike Barn, Gear-To-Go Tandems, Grey Ghost Bicycles, High Adventure Ski & Bike, High Peaks Cyclery, Placid Planet Bicycles, Rick’s Bike Shop, Tomhannock Bicycles and Berkshire Outfitters. When you see me out riding up some hill and I am smiling, it is due to several reasons: I really enjoy climbing and my bike fits me! Enjoy that new bike and make sure it fits you. If you have one that doesn’t fit, just put it up for sale and I know of several cyclists who will buy it from you at half price… So make sure it fits!